Apple supplier Foxconn could create 50,000 jobs in U.S.
One of Apple's biggest suppliers says it may spend more than $7 billion to build a new factory on U.S. soil that would create tens of thousands of jobs. Foxconn is famous for its enormous iPhone assembly plants in China. Its potential investment in the U.S. came to light last month when Softbank (SFTBF) CEO Masayoshi Son was photographed leaving a meeting with Donald Trump. 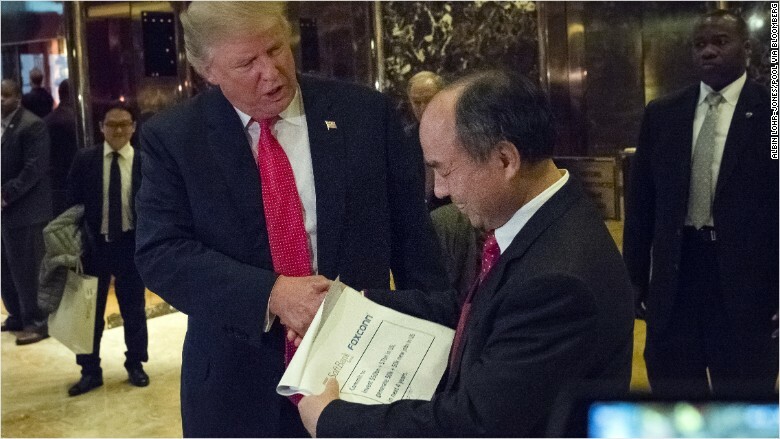 Son was holding a document suggesting Foxconn could create 50,000 jobs. Softbank CEO Son leaving a meeting with Trump in December. According to Japanese publication Nikkei, Gou also said that Apple (AAPL) is willing to invest in the new plant. An Apple spokeswoman didn't respond to a request for comment.